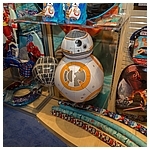 The 2017 International Toy Fair gave us a look into year three of the Star Wars brand under Disney's command. 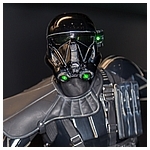 The new films are bringing in new collectors, which helps to keep the various lines healthy and diverse, while advances in 3D printing and scanning are helping to produce some of the most accurate and realistic collectibles we've seen. 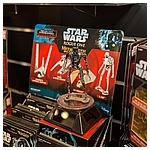 New Tamashii Nations And Bandai Hobby Goodness Displayed! 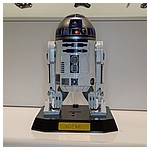 The night before the 2017 International Toy Fair began, we attended a very exclusive press event hosted by Bluefin Distribution that included a special sneak preview of all the Bandai Hobby and Tamashii Nations Star Wars collectibles they had on display for the industry exclusive event. The Bandai Hobby side of the display featured nineteen pieces from the scaled Star Wars Plastic Model Series, which will see a variety of ships from across the eight released live action feature films including eleven 1/72 scale kits: A New Hope A-Wing Starfighter, A New Hope X-Wing Starfighter, A New Hope Y-Wing Starfighter, A New Hope TIE Advanced X1, A New Hope TIE Fighter, Return Of The Jedi Interceptor, Rogue One TIE Striker, The Force Awakens Resistance X-Wing Fighter, The Force Awakens Poe's X-Wing Fighter, The Force Awakens First Order TIE Fighter, and The Force Awakens First Order Special Forces TIE Fighter; three 1/48 scale kits: The Empire Strikes Back Snow Speeder, Return Of The Jedi AT-ST, and the electronic A New Hope X-Wing Starfighter (Moving Edition); and four 1/144 scale kits: The Empire Strikes Back Slave I, The Empire Strikes Back AT-AT, Rogue One U-Wing Fighter & TIE Striker, and The Force Awakens Millennium Falcon. All of these kits are snap-together models that do not require glue, allowing builders to focus on paint and weathering. 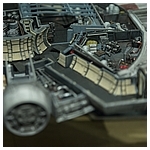 The models featured molded bases, many of them Death Star surface tiles (the A-Wing even comes with a Death Star turbo laser tile!). In fact, you may eventually see these tiles sold separately. The level of detail on these are really impressive. 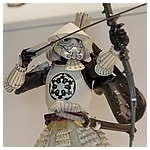 Not to be left behind by their peers, Tamashii Nations, celebrating their 10th anniversary this year, had their yet to be released Meisho Movie Realization Yumi Ashigaru Stormtrooper action figure along with some pretty terrific dioramas (that unfortunately are not included in the gallery above), and some great artwork of what we can expect to see in this line in the coming future. The line had us at "Meisho", so all we saw here left us wanting more! 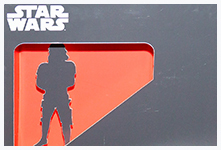 If the artwork shown actually gets produced as new figures, collectors can expect to see a Snowtrooper, IG-88, Return Of The Jedi Boba Fett, Gamorrean Guard, Shadowtrooper, Biker Scout, Darth Maul, and Queen Amidala joining this beloved line. 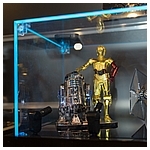 In addition to this, your C-3PO Perfect Model Chogokin figure from 2013 will finally be able to be displayed with his diminutive counterpart! The incredibly detailed 1/6 scale die cast Perfect Model Chogokin R2-D2 will be heading our way late summer or early fall this year. Artoo features all the articulation you'd expect, lights, a movie-accurate dome, panels that open, a retractable third leg, and, most interestingly, (removable)leg struts and Kenny Tubes! 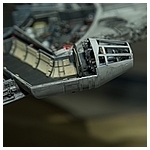 We don't believe we've seen this before in an Astromech collectible - it's a nice touch that demonstrates a deep commitment to detail. Keeping Star Wars Cute Through 2017! 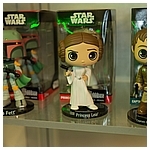 Funko displayed Return Of The Jedi Boba Fett, A New Hope Princess Leia Organa, and Rogue One's Captain Caspian Andor, Jyn Erso, Darth Vader, Scarif Stormtrooper (AKA: Shoretrooper), and Imperial Death Trooper from the Star Wars Wobblers collection; A New Hope Luke Skywalker, C-3PO, R2-D2, Yoda, Wicket, A New Hope Han Solo, A New Hope Princess Leia Organa, Return Of The Jedi Boba Fett, Chewbacca, Darth Vader, BB-8, Maz Kanata, Finn, scavenger Rey, First Order Stormtrooper, and Kylo Ren from the Galactic Plushies collection; A New Hope Princess Leia, Yoda, Return Of The Jedi Boba Fett, BB-8, (Starkiller Base) Rey, (unmasked) Kylo Ren, Chewbacca, Jyn Erso, K-2SO, Rogue One Darth Vader, Scarif Stormtrooper (Shoretrooper), Chopper, Kanan, Sabine, Zeb, Zira, and Ezra POP! 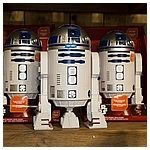 bobble heads; BB-8, Chewbacca, Wampa, and R2-D2 POP! 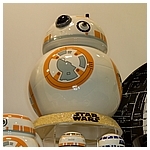 Tees T-shirt; BB-8, Rey, Darth Vader, Chewbacca, and Kylo Ren Lanyards; a series of Rogue One POP! Pens; Darth Vader & Stormtrooper POP! Home salt and pepper shakers; and Stormtrooper, Chewbacca, BB-8, boba Fett, and Darth Vader POP! Home ceramic mugs. The Annual Fan Media Event! A much smaller group of online media reporters and photographers than we've seen in years past made their way over to the New York Times building for Hasbro's annual Fan Media Event. 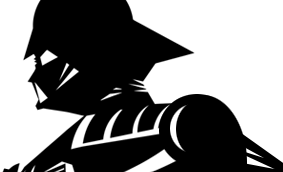 Hasbro wasn't the only place we noticed it, but it became apparent that the days where anyone with a blog or Twitter page could get in are long gone. We saw some people who attended the event in the past being turned away at the door. This certainly wasn't a bad move as it allowed more time for the invited reporters to speak with the people working on the lines. 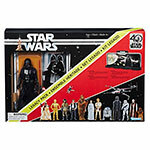 To celebrate the 40th anniversary of Star Wars, Hasbro will bet releasing a series of eleven 6-inch action figures on classic Kenner style cards, along with no less than two exclusive action figures, and a special Legacy Pack display set that includes a carded Darth Vader and a reversible back drop display that pays tribute to the original Early Bird set sold in the fourth quarter of 1977 the first assortment of action figures in the line weren't ready until the following spring and the original mail away Display Stand offered on the card backs. 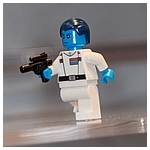 Like the original set, there are spots for all twelve figures coming out at retail. 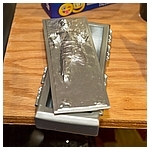 The Darth Vader action figure with the set is an entirely new sculpt and based on the Sith lord's appearance in the original film. 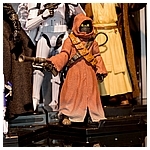 The second assortment, which is currently slated for a June release will include the previously released Chewbacca, Stormtrooper, and See-Threepio (C-3PO) figures from The Black Series along with band new figures based on the last of the original twelve from 1978: Sand People (which you're likely to find a bit earlier in The Black Series...), Jawas, and Death Squad Commander. 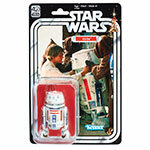 Collectors should also keep a space for the Star Wars Celebration Orlando exclusive Luke Skywalker: X-Wing Pilot and GameStop exclusive R5-D4 (don't think we didn't notice the non-Kenner name Hasbro...). 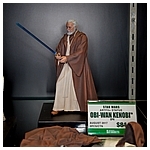 Hasbro also had on display the next assortment of figures in The Black Series 6-inch line. 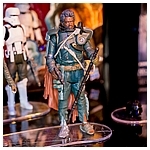 When last we saw Hasbro, at the 2016 San Diego Comic-Con, the prototypes for the Qui-Gon Jinn, Hera Syndulla, Lando Calrissian, Tusken Raider, and Emperor's Royal Guard, but this was our first unclose look at the full production figures and they looked great! 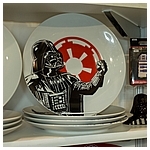 The Black Series 6-inch Centrepiece line may become a big hit. In what first appeared to be a reimagining of the old Unleashed collection, these are meant to be customizable display pieces that work well on their own, or with your other 6-inch figures added in. 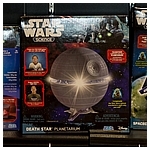 They had the upcoming Luke Skywalker Hoth Battle and Darth Vader Tantive IV Battle Centrepiece sets displayed with additional figures and, though it may not be apparent in the gallery above, embedded lights on. 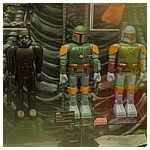 Not as much love was given to the 3 3/4-inch line with only two new action figures revealed, and both of them are simply newer versions of Boba Fett and Han Solo as they appeared in Cloud City. 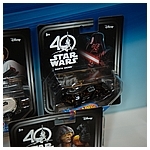 Beyond that, they also had previously announced figures including Admiral Raddus, Fenn Rau, Lieutenant Sefla, Galen Eros, and the Shoretrooper VS Captain Bistan two pack. 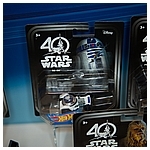 In this scale, however, is the upcoming Titanium Series die cast figures. Even though they were announced before this event it was interesting to see them in person. We're not sure this line is going to take off, but we'll keep an eye on it to see if it resonates with some of you. Blink and you'll miss it. 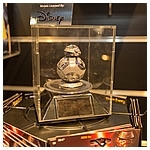 As part of the Star Wars display in their booth at the 2017 International Toy Fair, Entertainment Earth had a hand made mock up package for The Black Series Early Bird Hasbro is releasing this spring. Click the thumbnail above to have a look! 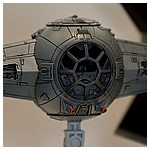 Following the announcements from the Hasbro Fan Media Event, official images were released. Click the thumbnails above to have a closer look. 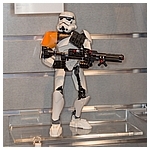 There were some cool new Star Wars collectibles on display at the Kotobukiya booth including the unpainted prototypes of The Force Awakens Rey & Finn ARTFX+ two pack (the painted samples weren't available) and The Force Awakens Poe Dameron & BB-8 (with thumbs up arm) as well as the fully painted The Force Awakens First Order Flametrooper & Snowtrooper and The Force Awakens Han Solo & Chewbacca, Rogue One Shoretrooper Squad Leader & Captain, Rogue One Death Troopers, A New Hope Obi-Wan Kenobi, and Rogue One K-2SO ARTFX+ sets, the Rogue One Death Trooper ARTFX statue, and a pile of novelty items. In addition to the upcoming collectibles, Kotobukiya also displayed a very cool Rogue One diorama featuring many ARTFX+ Stormtroopers wading through the shore of Scarif. 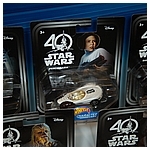 Mattel will be repackaging their Star Wars Ships, Character Cars, and Shipcars on 40th Anniversary cards. Click the thumbnails above to have a closer look at the first assortment to come in the new packaging. 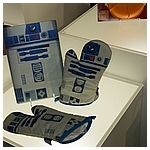 While there was only one Star Wars item on display in the Qmx booth, it was spectacular! 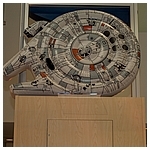 The Millennium Falcon Cutaway Replica is still in its prototype stage. 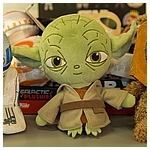 It hasn't received final Lucasfilm approvals just yet and price and release date haven't been sorted out. One thing is certain, this is going to be a must have as soon as it is available! For more of their booth, make sure to head over to Cool Toy Review. Formally known as Underground Toys, the initial 2017 International Toy Fair presence of Se7en 20 has our attention. in years past, we were drawn to the Underground booth, but their product line has become too cool not to discuss. 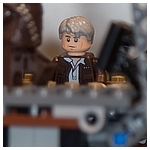 Click the thumbnails above to have a closer look at what we were permitted to shoot, and follow through to find out more on what they plan on officially revealing at Star Wars Celebration Orlando 2017. Following years of success limited to the doors they could open with their established name, Underground Toys rebranded themselves for 2017 as Se7en 20. 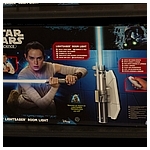 Despite the rebranding, their commitment to producing unique collectibles inspired by a galaxy far, far away hasn't changed. 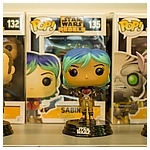 Collectors attending Star Wars Celebration Orlando 2017 will have the opportunity to be the first to publicly view what the company has in store for Star Wars collectors. 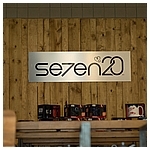 Those in attendance, as well as those that follow the event coverage right here, will have nearly look at the Pinache collection Se7en 20 will be officially unveiling at the event. 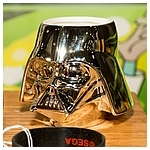 Unless their current trajectory changes, you can expect to see at least a series of Star Wars branded Swell-stlye water bottles, an assortment of travel mugs, spatulas, ceramic plate sets, tea cups, cutting boards, and even more plastic plateware than seen in the links above. 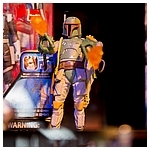 Have You Had Enough Of Boba Fett? We Didn't Think So. 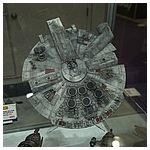 What's that we saw at Super7's booth at the 2017 International Toy Fair? 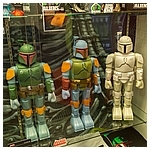 Is it a new colorway for their Super Shogun Boba Fett? You better believe it! 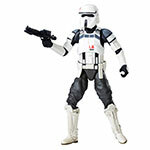 Moving past their first release based on The Empire Strikes Back and the second based on the classic Kenner colorway, Super7 is in the process of offering collectors a new version based on the original preproduction Imperial Super Stormtrooper version of what would become the nefarious bounty hunter we all know and love. 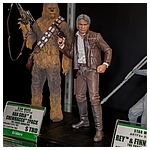 Click any of the thumbnails above to have a closer look at this new massive-sized figure as well as all the Star Wars items the San Francisco based company had on display. 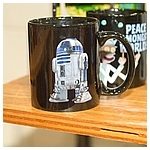 Beverages Always Taste Better In Star Wars Receptacles. Surreal Entertainment had some Star Wars stuff mixed in with all the other licensed products in their booth. We did our best to find all of it, but judging by the subtle designs some of the products in gallery linked above, we can't be positive we saw all of it. 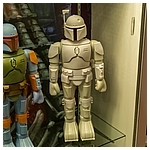 Whether you are a completist or a family-oriented collector, what SwimWays had on display in their booth at the 2017 International Toy Fair should be of interest. 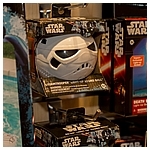 Click the thumbnails above to have a closer look at their licensed Star Wars beach and pool accessories! 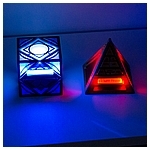 With the addition of the Rey Lightsaber Room Light and Sith Holocron, Uncle Milton also displayed the Rogue One packaging for their Star Wars Science line. Click the thumbnails above for the full gallery. 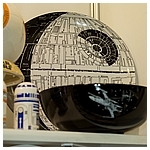 The Star Wars dish ware and tchotchkes on display in the Vandor booth had us considering a new subcategory in our collections. Click the thumbnails to have a closer look!